Why churches, you may ask. Churches serve two purposes: as places for Christians to meet and worship; and as an entry point to the past, to the history of a place. A church is the place in which we traditionally mark landmark events: our rites of passage such as births, marriages and deaths. This puts the physical edifice at the heart of the community’s expression of its own story. A church is also a place in which we remember those who have gone before. It is impossible not to be moved by some of the memorials to people about whom we know no more than it says on their gravestone or tablet, whose names are almost poetry themselves. We know little of Prudence Pengelly, James Bosustow or Patrick Jose but people like them lived, loved and died and were remembered here. They walked these aisles and made their contributions to the community of their time. And, if you need other reasons, churches were probably the most expensive building in their villages and are full of interesting architecture reflecting changing attitudes and ideas about Christian worship through the centuries and places where the wealthy could buy ‘attention’ and honour. And finally, searching for them takes us to parts we would not otherwise visit and thus helps us to discover new places. You can tell that we love visiting churches. There are apparently over 300 Anglican ones alone, not counting the many, many Methodist chapels. We have put an arbitrary date of 1700 on the limit of our interest. 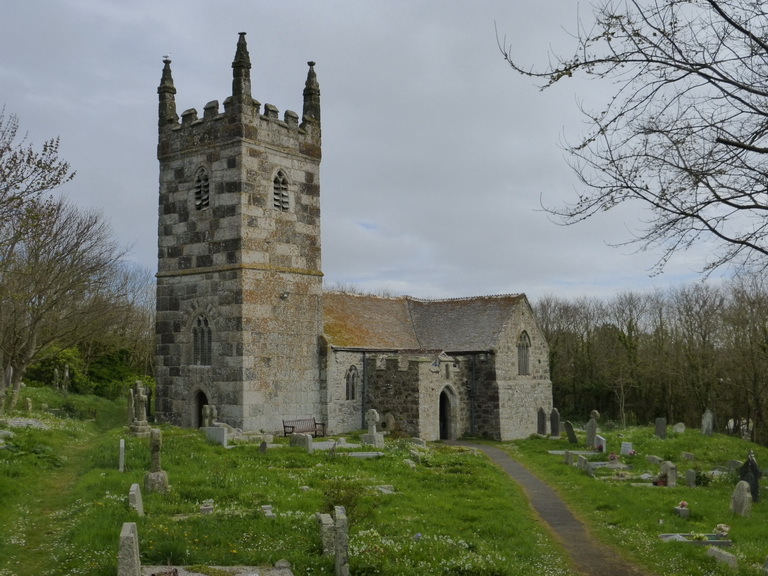 This is chosen with a degree of bias in order to include Falmouth’s 1662 church whose architecture harks which harks back to a more traditional time than its date would suggest and gets the total down to a manageable number. We haven’t counted how many that leaves as yet: perhaps 200 or so. We are too busy visiting them.